Played a lunch money-esque game at Texas Crint’s house last night from 6 PM – 8:45 PM (give or take). In attendance during my session were Texas Crint, MH62, Julio, Pinata, and Big John. It was a 6-handed game, so starting hand values went up, obviously. I was decently card dead for a lot of the time, and I didn’t play well. 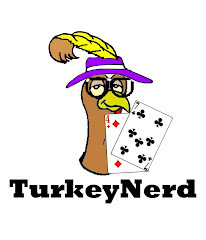 I made a theoretically bad laydown to Pinata, who pushed all in on a board of J-7-2 after raising preflop, and I had Turkey Nerd (7-4). It was a $17 raise into a $10 pot, and I tanked for a while, then folded, putting him on A-7/K-7, meaning I had 3 outs at best. He showed the bluff with 10-5. Not sure if I should have made that play, but I likely had outs if I had. Later, Texas Crint caught a 3 outer on my J-10 with J-2, and I paid him off on the river (read it like a busted flush draw, which was realistic given the way the hand was played). I later made a stupid all in call of $14 against Pinata, who had flopped a boat. After that, I was decently scared and totally card-dead. Not at all a good combination. I technically could have quit, but I wanted to grind through it. I didn't take unnecessary risks, which I am happy about... I saw 1 pocket pair and zero double suited hands in 12 Omahahands. I think I saw only 2 suited hands total in my Omaha time, which is quite odd. I played them tight and really didn’t invest much in these weak starting hands, which was good. Overall, I was stuck $50, which is not terrible, but I missed a few bets and should have called Pinata's all in early and not called that last $14 later. Given my cards, I estimate that I should have been stuck about $20, but I played well below my best for the last hour, and that led to the poor result. Chalk up $30 in losses to bad play and $20 in losses to variance.